A headteacher of a school near Camborne could see his scheme, encouraging pupils to be more virtuous, adopted by schools across the country. Kehelland Village School headteacher, Geoff Smith. The scheme, which praises children’s virtues such as hardwork, patience, caring and teamwork, was singled out by experts at the University of Birmingham who are lobbying Education Secretary Michael Gove asking him to endorse the scheme nationally. Mr Smith recently attended a two day conference at St Georges House, inside Windsor Castle, organised by staff with the university’s Jubilee Centre for Characters and Values. He was asked to write a charter on character education which the Government may consider introducing into the national curriculum. 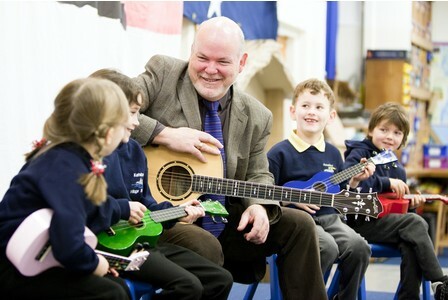 The headteacher, who has more than 20 year’s experience in teaching, works closely with pupils, staff and parents to strengthen pupils’ characters. Mr Smith is keen to see the project adopted by schools across Cornwall and is inviting headteachers to visit Kehelland School and see it being put into action. Tom Harrison, deputy director at the Jubilee Centre, said Mr Smith’s project was at the forefront of educational practices and was setting an “incredible example” for other schools. Previous Previous post: Character on the National Curriculum? It sounds like he visited Maxwell School on Vancouvre Island. They used a particular system which has many resources and is used in about 100 countries around the world. This can be found at http://www.virtuesproject.com . There is some research as to its effectiveness in schools that supports Geoff Smith’s opinion about its influence. There are trainers around the world who are qualified to teach people how to implement this in their families, schools, or other organizations. Thanks Derek -Funnily enough I did visit Maxwell School briefly a lovely place. The article is not quite right in that I first discovered the Virtues through a friend in the UK. However if you look at my links page you`ll see that I have linked to the Virtues Project which of course was the source of my inspiration- and I’m in touch with it`s new director Dara Feldman. Layard, R., Dunn, J., & The Good Childhood Inquiry panel. (2009). A good childhood. Searching for values in a competitive age. London: Penguin Books. Seems to me the whole UK system has been “primed” for a virtues project approach and therefore your efforts are very important, timely and hopefully will be a tipping point. I`d be happy to email you Birmingham University’s Charter for Character Education which was the purpose of the conference at Windsor and which proposes a framework of civic, personal and performance virtue – I`m not sure the divison of virtue into these subdivisions is necessary , but it’s what they’ve arrived at.. We are 5 hrs from London and you are welcome to visit and look at our school if it’s of interest.